Mechanical Engineering Students Association (MESA) is formed by staff and students of Department of Mechanical Engineering for conducting different social, cultural & knowledge based activities for all the students of engineering in campus. It conducts various events on the occasions like Teachers day, Engineers day, Gandhi jayanti etc. So that students can involve in these activities and gain some knowledge of management & become a responsible person in life. The team MESA conducts every event or program under the guidance of respective faculty In-charge Prof. Jarikote S. S. With the valuable guidelines of head of the department Dr. Sidhu J. S.
All the students of Department of Mechanical Engg. wished to all faculties in college by offering them a rose & a greeting card on this day. It’s a sign of respect from them. A small program for felicitation of all staff of Mechanical Engg. 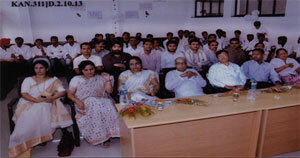 Dept., in the presences of HOD & all students, was arranged & carried out successfully. a) Lecture by B.E., T.E. (Mech.) Students on S.E. (Mech.) Class. c) Felicitation program for staff. a) Techno-hunt competition for all students. by Mr. Mahendra Wadje from CAD-CAM Guru Institute, Pune. Topic – “ Importance of Competitive exams”, by Mr. Yogesh Tyagi from Gateway Institute, Dhankawadi, Pune. An Expert Lecture by Mr. Prashant Singh, Deputy Manager HAL, on Alligning Manufacturing for A/C , Dt.- 18.08.2014 . 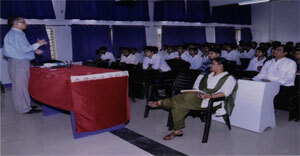 An Expert Lecture by Mr. Pradhan D.K. Sir of IGTR, Aurangabad, on Modern Machines & manufacturing, Dt.-26.09.2014. 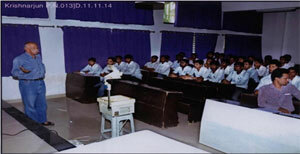 An Expert Lecture by Dr. H. Bagchi (Emeritus Prof.) on Analysis of Manufacturing Processes, Dt.-11.11.2014 . An Expert Lecture by K. Reddy, IIT, Hyderabad, on Recent Research Activities of IITs & Synopsis of R & D for staff & students, Dt.- 06.12.2014. An Expert Lecture by Prof . Kornel F. Ehmann of North Western University, Illinois, USA on Synopsis of Micro Manufacturing R&D at North Western University, USA Dt.- 06.12.2014 for Staff. An Expert Lecture by Prof . Kornel F. Ehmann of North Western University, Illinois, USA on Institutional Research & Resource Development for Senior Staff, Dt.- 07.12.2014. An Expert Lecture by Dr. H. Bagchi (Emeritus Pro.) on Leadership Qualities, Dt.- 19.03.2015. An Expert Lecture by Dr. H. Bagchi (Emeritus Prof.) on Super Conductors for T.E. & B.E. students Dt-. 19.03.2015. 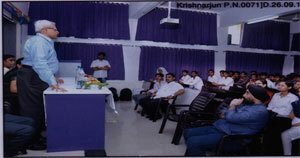 An Expert Lecture by Dr. K.G. Narayankhedkar (Director General, MGM.) on Cryogenics, Dt.- 19.03.2015. An Expert Lecture by Prof. Suhas Joshi of IIT,Mumbai on Micro/Macro Scale manufacturing, Dt.- 03.04.2015 for T.E. & B.E. Students. An Expert Lecture by Mr. Tejander Singh , Alumni of the college, has given an informative lecture on CAD software & its applications Dt-15.04.2015. ISTE online workshop on ETD at Remote Centre from 5 Feb.To 29 April 2015. Total 105 in 3 Batches Proposed in the Month of May-2015. STTP training by Innovation Unlimited Group arranged on Saturday, Sunday & Monday in the month of April-2015 for T.E. Mechanical Students. 5 students appear for H.P. Campus Interview at Pune. 5 students sent for In-plant Training at HAL, Bangalore. 5 student sent for In-plant Training at Schneider Electricals at Bangalore. Teacher’s Day Celebration on 5th Sept. 2014. Engineer’s Day Celebration on 15th Sept. 2014. Debate Competition on 17 Sept.2014. b) 2nd Prize at IIT, Delhi. Gandhi Jayanti Celebration on 2 Oct. 2014. Boxing Competition at M.I.T., Pune. “Multiobjective Optimization of End Milling HCHCr using ALC-rN PVD Coated Cutters with MOGA and RSMO”, Proceedings of the ASME 2014 International Manufacturing Science & Engineering Conference, June-9-13, 2014, Detroit, Michigan, USA. “Analysis of Used oil on the basis of Wear Volume using Taguchi Method”, IOSR Journal of Engineering, ISSN)e) : 2250-3021, Vol-4, 2014. Selected as Referee for ASME Journal on Tribology. Invited on Advisory Committee of Information in Engg. Educaiton at COE, Pune. Chairman of BOS & Academic Council of SRTM University, Nanded.